The Bemrose School have been supporting The University of Derby for several years by taking Childhood and Youth Studies students on placement. These placements are for 2 days a week throughout the academic year, with third year students also completing extended 2 week blocks throughout the year. Students have been successfully placed across Inclusion, on rotation across departments initially, followed by at least 2 terms within one particular area. Students have chosen to be based within: Care and Guidance (pastoral), the Elmtree unit (ASD) and the Enhanced Resource Facility (ASD and communication difficulties). All students undertake the role of teaching assistant for part of their day, supporting students with special educational needs within mainstream lessons. In addition, some students have successfully planned (with support) and delivered small intervention groups. The school also offers the opportunity to enhance their understanding of teaching and learning of BEd students through enhanced placement opportunities. Students are usually placed in pairs and are in the school for a week, largely to observe SEN teaching and help out, though they do have a small teaching task to complete at the end of their week in school. 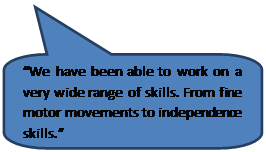 We have also offered extended placements to third year Occupational Therapy and Theatre and Dance students in the past.